…is Contagium‘s Archaic LP. The album contains 9 songs of pure aural bliss from these three Halifax punks. Contagium knows how to seek out a lumbering rhythm, and use it to plod along through a song until piledriving the speed at just the right moment, allowing chaos to ensue. The sparingly-used vocals are bleak and hoarsely wretched from their throats amidst a heavy dose of reverb. The songs are well-constructed and have a fair amount of melody to them without sounding wimpy. Amongst all the crust madness lies a touch of Heresy influence, which sets Contagium apart from some of their crust counterparts. I really want to compare Contagium to Axegrinder, but that wouldn’t be fair, as they offer more than just homage to the UK crust classics. The similarities come in the slow, brooding riffs and the slight hint of melody, but the main difference is that Contagium isn’t infected with the polished-turd production of the Axegrinder material. It wouldn’t be fair of me to talk about this record without mentioning the artwork and layout. All the artwork is done by one of the bandmembers, and it definitely helps set the murky tone of the songs held within the sleeve. 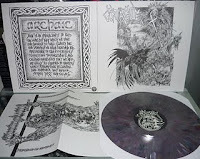 The record jacket is white with scratchy scrawled artwork of a skeletal beast holding a cross, and a raven perched with some battle axes and severed heads. There’s also a poster with the lyrics on its back side that looks like something from an Entombed demo, and the vinyl is a purple splatter. The Total End Records doesn’t have a website, but you can find this record in various distros. I feel terrible not knowing this guys, however after myspace listen, I am about to order a copy, hopefully arrive before New Year.